On November 1, Moreau-Grand Electric Cooperative visited Takini school and gave a presentation on electrical safety to students in grades Kindergarten through 5. 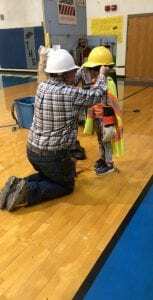 Students learned first-hand about electrical safety awareness and what it is like to dress up with all the safety equipment that linemen wear. “We’re teaching future cooperative members to ‘Look up, look down, and look out,’ because there are electrical hazards all around us. It [the demonstration] is designed to keep our members safe,” said Roger Lawien, presenter and MGE Director of Member Services.